Little Creatures, nestled on the corner of Club Street and Mohamed Ali Lane, is like a step into another world. While the architecture provokes an industrial feel, lots of light and rustic tables give the venue warmth. There is a garden leading right out onto Club St. for a more casual and intimate experience. The space is quite large, allowing more space for friendly gatherings as compared to other parts of Club Street. 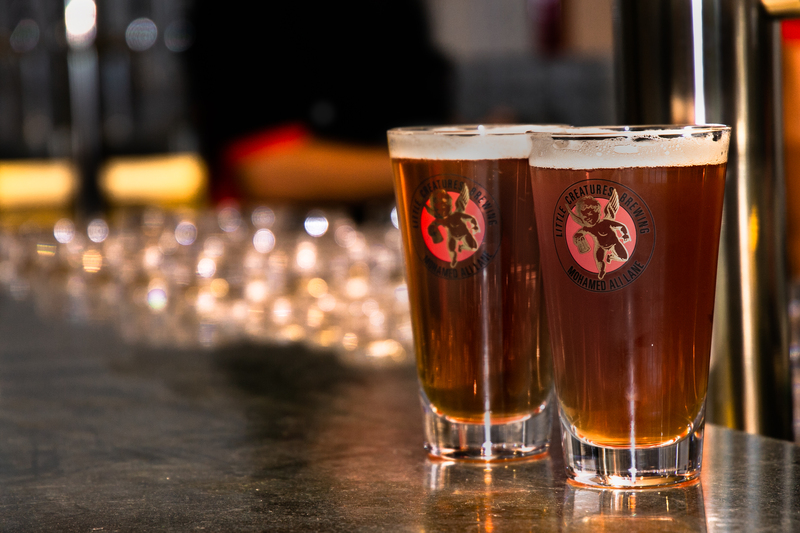 The concept behind Little Creatures focuses primarily on the creation of craft beer, but, you don’t have to be a beer connoisseur to enjoy their artisan brews. The staff is adamant about everyone enjoying their brewery, from the most knowledgeable brewers to first-time beer drinkers. Their traditional flights offer a host of drinks from the familiar pilsner to a tropical Rodger’s. Their staff is prepared to guide you through the drinks, and they also have handy cards that explain the ingredients and process for those who might need supplementary material. The food rivals the beer in quality, creativity, and overall appeal with a large selection of appetizers and entrees. Not your typical pub food, there is a host of dishes that you can pair with your beer. Don’t drink? The risotto alone warrants a visit. The Chicken Rice Risotto ($26) is creamy and comforting (and they also have a vegetarian alternative). For more traditional bar snacks, the Baby Pork Ribs ($28) are cooked just right and the rosemary seasoning provides a more dynamic and sophisticated flavor than typical bar ribs. Their most interesting dish, in my opinion, is the chili mussels which pays homage to the Australian roots of the venue, with a Singaporean touch. The Chicken Rice Risotto ($26) is comfort food at its finest. Truly prepared for anything, this brewery opens at 8 am. For those of us who don’t partake in a wake-up beer, they have quite a substantial breakfast menu. Technically, you could spend all day at Little Creatures having pale ales to tie you down between meals; from 8 am to well past the sun sets. Overall, Little Creatures is a homey brewery with a warm and intimate atmosphere perfect for a variety of occasions. From a business lunch to after work drinks it is truly an inclusive dining and drinking experience.